He came in like a lion and went out like Elmer Fudd. Fresh from sunny Florida, Steve Spurrier promised touchdowns, victories and a steady stream of biting bon mots; in two seasons with the Washington Redskins, the befuddled Ball Coach delivered ugly losses, pained sideline grimaces and a botched resignation seemingly inspired by the fall of Saigon. Of course, by local standards this was hardly unusual. Lost in the euphoria over Joe Gibbs' return? Only this: Michael Jordan, unemployed. Jaromir Jagr, untradable. Chamique Holdsclaw, unable to crack 10 wins. The [lowest] common denominator? We're living in it. Or just slowly dying, provided your work clothes read "WIZARDS" on the front. Boston endures the Curse of the Bambino. New York suffers its ravenous tabloid hounds. But for sheer star-destroying brio, Washington stands alone, a capital city of corrosive athletic ineptitude. From the dearly departed Spurrier to the indefinitely injured Jerry Stackhouse, we're a wing-zapping bug light to the sports world's best and brightest - a town where Ted Leonsis struggles to squeeze dimes out of dollars; where Dan Snyder's millions seemingly conspire against him; where coaches come and go like the dweebs on "Average Joe"; where first-round draft picks yield a bumbling harvest highlighted by [but not limited to] Heath Shuler, Michael Westbrook and Kwame Brown. Twice in the last four years, we have proclaimed Washington to be Loserville, the sorriest city in professional sports. As it turns out, our fair 'burg is something else entirely. Something far worse. We're the End Zone: the place where sports saviors come to die. Or at least get fitted for funerary garments [XXXL, in the case of Ike Austin]. And no, this does not bode well for the Redskins' once and future messiah. By now, the pattern is familiar. Our athletic Mr. Smiths arrive in the capital as hard-charging outsiders, blessed with the winning wherewithal to reverse years of inside-the-Beltway ineptitude. Determined to shake up those fat cats in Washington, they promise to do things their way - charge admission for training camp as opposed to making it free, live in Chicago instead of D.C., golf in lieu of burning the midnight oil at Redskin Park. Invariably, though, they stumble. Crumble. And wash out. In the manner of countless political reformers before them - Newt Gingrich comes to mind - they are co-opted by a culture impervious to change, rendered as irrelevant as a van load of DUKAKIS '88 bumper stickers. After signing with the Wizards, Gilbert Arenas promised Washington would make the playoffs. In his fourth game, the cocky guard notched a triple-double in an upset win over the mighty Dallas Mavericks - then missed 14 contests with an abdominal strain that again has him sidelined. Or take Jordan. His arrival was greeted with the sort of giddy enthusiasm generally reserved for Redskins minicamp. His Airness would lift the lousy Wiz, boost the downtown economy, serve as a role model for our troubled youth. All of that before he put on a Bullets throwback jersey. Pollin: Leonsis, who is this man? 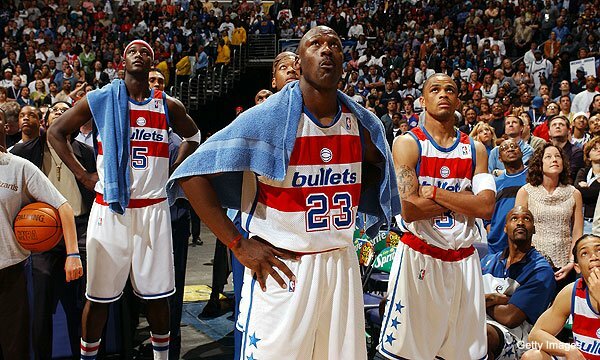 Ted Leonsis: Michael Jordan, sir, No. 23. I brought him to Washington. He's your meal ticket. He wants his front-office job back. Pollin: Jordan, eh? I don't like the cut of his jib. Out of my office, you balding Slug-a-Bed! Release the hounds!" Like predecessor Mitch Richmond - the shooting guard who took off from Sacramento an All-Star and landed in Washington a creaky old man - Jordan had a reasonable excuse: He was pushing 40. But no matter. Fact is, our city's star-sapping vortex swallows the old and young alike. All-Everything at Tennessee, Holdsclaw was touted as the Jordan of women's hoops. Her next Spike Lee commercial will be her first. High-schooler Kwame Brown was the No.1 pick in the NBA Draft. Frustratingly inconsistent, he appears as flummoxed by dry cleaning as by double-teams. After carrying Indiana to an unexpected berth in the NCAA title game, Jared Jeffries joined the Wiz and promptly blew out his knee. During practice. D.C. United's Ben Olsen followed an MLS Cup MVP performance by fracturing his ankle while playing in England [apparently, the End Zone crosses oceans]. Always durable Mia Hamm missed half a season with a bum knee of her own. Looking back, it's a wonder Spurrier didn't rupture his MCL while pitching out of a sand trap. Sadly, what works in other towns doesn't work here. Soccer powerhouse Real Madrid signs flashy superstar David Beckham. Becks notches a header in his first home match, and the club captures the Spanish Super Cup. Along the same lines, a good Capitals squad lands Jagr. The former Pittsburgh forward falls well short of his previous standard - understandable, since half his goals seemed to come against Washington in the playoffs - and the Caps slowly fade into 'Bolivian. And don't think our owners have it any better. Simply put, their money isn't good here. Never mind Canada: Mexican teams probably enjoy a better exchange rate than Leonsis, whose Caps expect to hemorrhage as much as $30million this season. Year after year, the New York Yankees spend their way to the World Series. Does the trick for King George. Snyder, by contrast, has reaped little from the same tactic. Save a warehouse's worth of discounted Bruce Smith Sack King T-shirts. Speaking of which, the whole tedious Quest for the Golden Sack illustrates the signature effect of the End Zone: Washington's athletic deliverers not only fail to make a difference, but also get sullied in the process. And by sullied, we mean Bill Clinton, post-Monica. And Monica's blue dress, post-Bill. Smith acquired a reputation for selfishness. Jordan's extramarital dalliances became public knowledge. Worse still, NBA owners are no longer willing to give him something [a piece of a team] for nothing [his regal presence]. Spurrier joined the fraternity of college coaching savants who couldn't cut it in the pros [Phi Kappa Lou Holtz]. Even Jeff George felt the sting, arriving as team cancer with a golden arm and departing as a team cancer whose golden arm can't land him a job on an NFL scout team. To put it another way: Jagr, once on the short list for Best Player in the World, now languishes on the trading block. There, he can barely get a sniff from the New York Rangers, a club that routinely gives millions to the likes of Theo Fleury. What's next - revelations that Gibbs built his racing empire by bilking millions from a orphanage? Though it's fashionable to blame the usual suspects - Snyder, Jeffrey Maier, the hot dog-lovin' Rod Strickland - for D.C.'s status as a sporting Black Hole, our overwhelming athletic futility suggests something larger. Something cosmic. Something more than dreamt of in Wes Unseld's curious player-acquisition philosophy. Recently, astronomers determined about 80 percent of the matter in the universe consists of cold dark matter - mysterious subatomic particles that neither emit nor reflect light and may form the stuff of black holes. Since dark matter can only be detected indirectly, is it really a stretch to speculate that a clump of the stuff resides right above the baskets at MCI Center? Or that dark matter's gravitational pull led Gus Frerotte to match foreheads with a concrete wall? OK, so maybe you're not convinced. Still, consider this: Last spring, Hamm led the Washington Freedom to the WUSA title, the city's only championship in 2003. Her reward? The entire league folded. Other possibilities: The Bermuda Triangle has migrated north, stopping for dim sum at Tony Cheng's. FedEx Field rests on an ancient Indian burial ground. Contemporary American Indians have cursed the Redskins and their offensive moniker. A vast right wing conspiracy labors to keep federal sporting power in check. A vast left wing conspiracy is holding our teams down, the better to draw attention away from the ever-growing welfare state. Vice President Cheney uses United games as his "undisclosed location." Perhaps the Freemasons - in league with the FBI, the CIA and Opus Dei - are employing the Washington Monument to control talent-sapping orbital lasers. Absurd? Maybe. But it would explain Trung Canidate's inability to pick up a blitz, not to mention some of the kooky stuff on the back of the dollar bill. Whatever our source of woe, some things seem certain: The Caps will start slow, then lose to the Penguins. The Wiz will swap young and promising for old and decrepit. And barring a transfer to Man U, 14-year-old soccer prodigy Freddy Adu will end up as an "E! True Hollywood Story." Provided he doesn't enter rehab first. Such is the power of the End Zone, an enfeebling, inescapable force that even the mighty Gibbs would do well to avoid. Granted, the man led the Redskins to three Super Bowl victories. He knows what he's up against. Still, even exceptions can only flaunt the rules for so long, particularly when they sign off on drafting Desmond Howard. Take it from Spurrier, who only at the bitter end grasped both a 9-iron and the terrible truth: While his beloved sunshine Gators play in a Swamp, Washington was built on one.